Home » Blog » Acrylics » It’s National Puppy Day! Puppies, like babies, are too cute to resist. Ahhhh puppies...we want to cuddle them and enjoy their clumsy playfulness! Those soft bundles of energy are great stress relievers. No wonder then that an entire day is devoted to puppies! In fact, on UN International Day of Happiness, (March 20), employees at Toronto's Klick Marketing Agency had a special treat in store for them; puppies were delivered to their workplace. In this clip from CTV news, employees talk of the benefits of having visits from puppies. For National Puppy Day, I am sharing a few favourite puppy photos. Although I wasn't painting when these furry companions were puppies, I have painted them as adults. Meet Storm at about three months old. It's impossible not to fall in love with those adorable blue eyes. This puppy is so tired! In this, my most recent pet portrait, I painted Storm against old wood keeping in mind that Storm is an outdoors kind of dog. I imagined him in front of an old barn. Storm loves camping in Algonquin Park with his human family. Early in the evening, as the sun dips down into the lake, (and sometimes sooner), he retires to the tent where the family will sleep. Storm is telling everyone it is time for bed. Storm painted in acrylic on 20" x 20" gallery wrapped canvas. But his greatest joy by far is running excitedly out in the fields whenever he is in the country. After all, there are so many new smells to discover! As a youngster, he often went hunting for partridge and geese with his owner. Storm is a senior now. At 12 years old, his old bones are often sore and he isn’t quick as he once was. Like many dogs his age, he has lost his hearing, and probably some sight as well. However, that doesn't stop him from meeting his friends in the local park for a few quick sniffs here and there to say hello. I first painted Phlox in 2017 against a red background with her long hair flowing in the breeze. Since then, she has been printed many times on bags and cards for other Dutch Sheep dog owners. She was painted again in 2018 on a birch slice. Below you see her as a puppy in two photos, and then more recently with her long hair covering her eyes and making her look quite mysterious! Phlox is happiest when she is sitting on someone's lap. In winter, she can be quite the source of heat. Read her story here. Emma has always been more on the Golden side in appearance. With her big brown eyes, she is simply irresistible especially when she sits under the kitchen table and begs for bacon, or toast, or any morsel of food that her owner might surreptitiously feed her. Sweet, even-tempered, adult Emma, now seven years old, was painted on a birch slice for Christmas, 2018. Finally, Chico, a Havanese, was our second dog. Our first dog, a Maltese named Mopsy, had seen our children grow up to adulthood. When she died in 2005, the house was much too quiet. Of course, we just had to have another greeter for our guests! Chico was the perfect dog by far...he loved adults and children alike. During puppy obedience classes, he had everyone in stitches with his funny antics. Always the clown, he would skip and hop down the hall to greet everyone at the front door. During summer months, he sat at the door or window and watched all the action outdoors. He was a carefree, happy dog until he became sick later in life. Chico, only a few months old, below. Don’t you want to hug me? Aren’t I just the cutest little thing? Keeping one eye open on the action happening around me! A year ago, we said our final goodbye to our Chico. Over the years, I painted him many times. Order your own pet portrait! For other pet portraits, visit Custom Pet Portrait Page where you will find the details regarding a commission of your special companion as well as a price list. Contact me if you wish to commission a pet portrait. I am now taking orders for May. 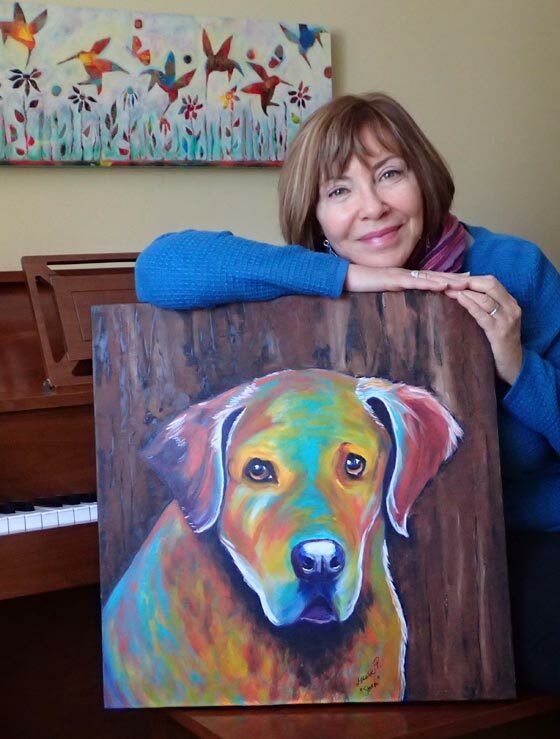 Keep in mind that it is also possible to have your pet painted on reclaimed wood or on a wood slice. If you have other suggestions, please let me know. For example, a client asked that her cats be painted and then the portrait transferred to cushions. These are conversation starters in her family room. In the meantime, give your favourite pet a hug and a special treat today! They are all such sweet companions in our lives. Afterwards, share your favourite puppy story with my readers below! P.S. Sophie, our Maltese should be mentioned too although we never saw her as a puppy. Sophie joined our family when she was three years old. I sketched her and painted her as well. Here she is with Chico in various photos over time. Sophie relaxing in her favourite pillow. It’s a lazy kind of day! I dare you to move me! All of your dogs are so adorable and precious, and your paintings are beautiful! Thank you Sally. It’s hard to imagine not having a dog in the house as we have had one (at least) with us since 1992. Much appreciate the kind words Sally. LOL! I take it to mean that you like puppies!